Calling all designers! 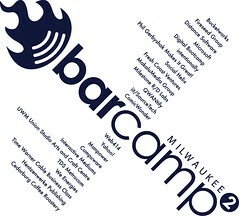 we've just kicked off a contest to design this year's BarCampMilwaukee3 t-shirt! Submit your design and get recognition and 2 free shirts shipped directly to you.  The t-shirt will be dark gray or black.  Two colors max, with one color being white. The second color will print on top of the white on a dark shirt. Using only white in the design is OK.
 Design space is 12" x 12" max (no wraparounds, etc.) front and back.  The design should capture the idea of sharing, learning, community, equality, technology — along those lines.  The back must include sponsor names as listed on the site at http://barcampmilwaukee.com/sponsors. A list will probably work the best, but hey, if you have a crazy cool idea, just make sure all sponsors are listed and are treated equally on the back design (i.e. Don't make some sponsor names huge and others tiny — all sponsors are equal partners).  Do not use copyrighted images in your design.  T-Shirt designs must be your own work and not copied from someone else.  The contest is open to any designer who wishes to submit a design, whether local to the Milwaukee area or anywhere in the world.  The winning shirt design will be announced on the BarCampMilwaukee site on September 15th, 2008.  All submissions will be posted on the BarCampMilwaukee.com site with the option for comments by the public, for input. 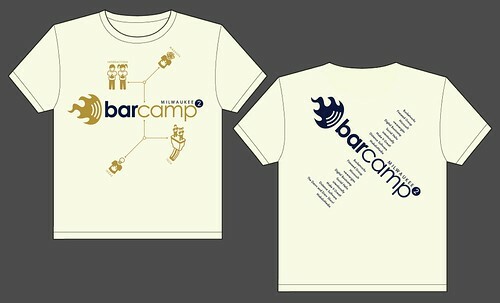  The final decision on the winning shirt design will be based on comments by those who view and vote on the designs, and selected by the organizing committee of BarCampMilwaukee.  We reserve the right to make technical adjustments needed to print the winning design on a t-shirt.  Winner receives 2 final printed T-Shirts in whatever size they wish, shipped to them directly. Questions? Leave a comment below.